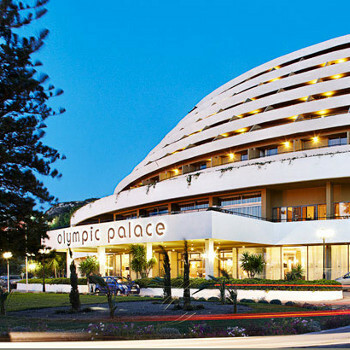 The Olympic Palace hotel and studios offer large, comfortable rooms and a friendly service, making this an ideal choice for families. There are non-stop activities on offer to entertain the whole family, including entertainment and weekly Greek evenings. This Hotel is the best Hotel I personally have stayed in,its spotlessly clean ,the staff are happy helpful and nothing is a problem .The food is excellent with plenty to choose from, I must mention Parismo the matradee ,what a lovely man and the waiter Andreas was spot on with his service ,along with Morfi .The rooms are spacious and cleaned to a high standard everyday. The pools are clean and sunbeds a plenty. Love this place. Hotel tip: Tip the waiters ,they deserve it. half board, is ok for one week, but then it can get repetative. a wide choice, but catered for the germans. having changed our evening meal for a lunch time meal was a bad choice, dont do it..and your not allowed to take the water you purchased in their shop in to have with your meal. the room was cleaned every day and to a good standard. fresh towels floors washed and beds made up. the beach is a stones throw away, but be carefull of the road to it, the cars will stop if you step onto the road. watch out for the motorbikes though they whizz past at a fast speed. rhodes town is a short taxi ride away, it will cost you 7 euros . and well worth at least spending a whole day there. make sure you have plenty of money, everything is at least double the price of things. in ixia there is a cool breeze blowing all the time, and especially welcome at the beach. the beach is made up of large pebbles, you can buy beach shoes for 5 euros, so you can wear them into the sea and walk on the pebbles without falling over. the hotel staff were polite and friendly. the annimation team were excellent. you must have at least one game with them, they work very hard. julio, andy, katie and laura..a big cheer for you all..
We stayed for 11 nights half board at The Olympic palace. Arrived at 4 am after 4 hour delay at Gatwick.Our room was at the front, so we had a lovely sea view at no extra cost. When we booked, Thomas Cook said we could have a free upgrade to sea view if available. Thank goodness, we were so lucky.some people paid 130 euros to upgrade to sea view. This hotel is lovely. I would definately go back there. The pool area was very nice, 2 pools plus the baby pool, indoor pool also. we went August bank holiday, would recommend this date as the hotel starts to get a little less busy. We never had any trouble getting sunbeds.Not a great deal to do in Ixia.get the bus to Rhodes town , we went in the evening and during the day, what a beautiful place...go to the waterpark at Faliraki,bus to rhodes town then free bus to waterpark.we had a fantastic time in Rhodes. book Thomas cook for the free child place as this saved us heaps and got us the sea view room. What a dump, simple as that. If anyone reading this is thinking of going here take my advice and forget it. Go to the next hotel, Rodian Amathus absoultley fabulous. Just returned from Rhodes this week and thought the hotel was excellent value, although definitely only 4*. We had a last minute deal and had pre-booked and paid extra for a sea view (an absolute must, because rooms at the rear look onto a cliff face!). The large balcony was private and and the room very spacious, with an extra area including a settee/bed, with small table & chairs. Daily maid service, with sheets and towels changed every day and kept very clean. The rooms could do with updating though and some new furniture and bedcovers wouldn't go amiss. Bed and pillows very comfortable! The food was some of the best quality we've ever experienced at a Greek 4* hotel. Breakfast was what you would expect to get: fruit, yogurt, cereal, full English, cold meats, croissants, cake etc, but the real treat was having a good selection of food for the evening meal. What a change from the normal 'canteen type food' you often get in hotels. There was always plenty of choice on the buffet, along with a chef cooking some specials and also very often they offered a separate al la carte menu too, at no extra cost to HB guests. Service in the resaurant was excellent and half a carafe of house red was 5 Euros. We didn't experience the hotel entertainment, preferring to spend the evening at one of the local bars. Plenty of sun beds around the pool, although it was end of September when we stayed and I suspect the hotel was not full. We stayed in this hotel for 2 weeks this summer after the first day we were asking for a transfer ! Rooms are terrible if rigsby from rising damp had shown me in I could understand. Food little or no chose not always buffet as stated waiter served choice of 2 meals meat or chicken with mashed potato and mixed frozen veg, tables were not cleared whilst eating, we once reached 8 plates on our table. dull dim dirty rooms, 70s decor, rank carpets, no fresh juice at breakfast(squash), croissants do not exist here, water melon and grapes for 2 weeks night and day. The pool is a joke the water was so cloudy you could barely see through it, I dived down to the bottom one day and the filth that was down there was shocking all the filters were clogged up. My son was sick after 3 days and I swear it was that water. The beach opposite is described as gently shelving shingle and sand more like shingle rock and fag butts not pleasant do yourself a favour and stay at the Rhodos palace up the road now that is a 5 star hotel not like this dump. not anything special. As we walked up to our room along very dark corridors we realised that this maybe was not the 5 star we had hoped for. Our room was very basic with many items either falling off walls or just very shabby. appalling. We queued for at least 15 mins every evening just to enter the restaurant to be led to a dirty table with the previous occupants dirty plates and cutlery lingering there. We had to ask the waiter at least twice for everything we needed and on some occasions just gave up and went to a neighbouring restaurant. After the first evening we had enough and asked to be transferred to another property - anywhere but alas all the decent hotels were fully booked. Our representative did nothing to assist with this and we resorted to grinning and bearing it. The entertainment was second rate and not worth listening to although you couldn't help that if your room was overlooking the pool. Both the pool and rooftop bars were charging exorbitant prices for alcoholic drinks and the service very slow. Hotel was in a good location, right opposite the beach. And if you opted for a sea view (which in my opinion is a must) the views were spectacular, the balcony was large and very sunny. The rooms were kept clean, towels changed daily. Lovely pool area but not very clean, floors were never cleaned the whole time we were there. The same food an drink stains were there all week, and the pool always seemed cloudy. All the usual pool games were played, volley ball, aerobics, darts. The food in the hotel was average, some days better than others, breakfast being the best. You could opt to take lunch by the pool if you wanted instead of your evening meal,we only found this out on our last day. The staff at the restaurant were very few and far between and very slow!we had to que up outside until you were shown to a table, the thing that annoyed me was there was loads of empty tables but all dirty not enough staff to clear and re-set. This is supposed to be a 4* hotel but I would say not quite! All in all everything was adequate and we had a lovely holiday. The Hotel was excellent. The room walls were a bit rough like artex gone wrong, but that is my only complaint. The rooms were mostly carpeted which absorbed any sound from neighbours, we hardly heard a thing and the hotel was very busy. We had one of the rooms which overlooked the cliff, at first we considered asking for a room with a sea view but discovered that our room kept very cool without the sun blazing in. The weather was scorching, absolutely gorgeous. The rooms were cleaned every day, maids were very nice, appreciated us trying out some Greek on them!! The food was excellent, slightly repetitive, but very tasty, the tiny pastries were excellent. Waiting staff were very nice could not do enough for you. Hotel location was ok, shop were ok, nothing to write home about. We spent most of our days up at St Paul's bay in Lindos, the small cove there is excellent, and the shops at the Acropolis are really good, they have vines growing overhead which made walking about much cooler, more pleasant. We would recommend the Swedish cafe there, very good. To be fair we only went up to the entertainment in the Hotel once, it was ok. I would visit the Olympic Palace again but would be more likely choose something closer to Lindos just due to its lovely locality which Ixia lacks. We visited in August last year (truly high season!!) This is one of the things you start having to do when your kids get to school age. The pool, or the three pools, are very busy. I am afraid it is towels at 7.00 am for loungers!! But if you are prepred to do that, you will get a nice space. Just don't expect to arrive at noon and find any space loungers! We loved it, we have booked to go next year. And have contacted the hotel directly to secure a good room. OH and whatever you do try to book a sea view.. the Back view is not good.. directly onto a mountain.